Bold yet sophisticated design. 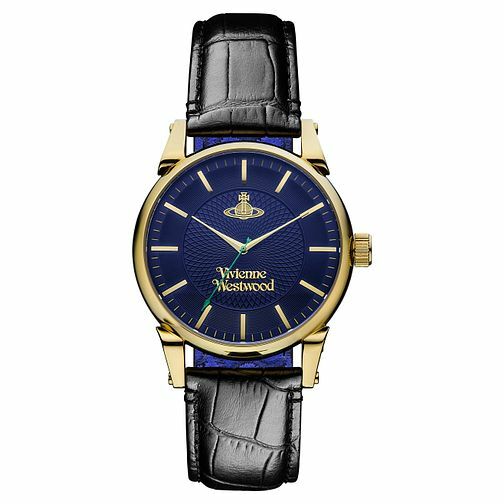 This men's mock croc leather strap watch from Vivienne Westwood's Finsbury collection showcases a deep blue dial with gold tone hour markers and hands, whilst set in a rich gold-plated case. Vivienne Westwood Finsbury men's black leather strap watch is rated 5.0 out of 5 by 1. Rated 5 out of 5 by Anonymous from Excellent Purchase I bought this watch as a Christmas present for my son. He has never worn a watch prior to this and always stated he didn't need one as he has his mobile phone to see what time it is. I was not 100% sure he would wear it but I took a chance since the watch looked so good. He absolutely loves it and has been wearing it daily since Christmas. Everyone admires it (which he loves) - he is 21 years old. It is a lovely watch and I would highly recommend it is purchased. Ernest Jones were a great company to deal with and the staff couldn't have been more helpful.